The title and abstract are 'hooks' that you can use to encourage your intended target audience to read your paper. Most people find papers using internet searches and databases, such as Pubmed, in which only the title will be displayed or title and abstract in others. An effective title will capture anyone that might find your research useful or interesting and encourage them to read the abstract, which should lead them to read the paper, and with your conclusions, they will be able to cite your work and build on your research. To be effective, the title and abstract need to be self-contained and accessible, so that potential readers can understand the findings. Be accurate and specific to allow reader to determine its relevance. Be brief and avoid excessive detail. Be clear by using simple language and avoiding unnecessary acronyms and jargon. Be declarative to understand the context and impact of your findings. Engage the paper's audience by specifically emphasizing the range of applications of your findings. Focus on the main novel finding instead of summarizing the entire scope of the paper. Avoid questions. Instead be assertive and provide an answer. Avoid puns. You culturally diverse readership may often miss the humor. An introduction to provide context for the findings. This can include a short general introduction, if required, and conclusions from previous studies to provide context for why this topic is important and what is already known. These 2-3 sentences should lead the reader logically to the next section. The 'gap' or problem, and the objective. Rather than saying that something is not yet certain, instead explain which features are known and which are unknown, as well as why uncertainty is a problem. Then state explicitly what you aimed to investigate. "Here we show..." statement to directly contract the gap of previous knowledge. This is the headline conclusion of your study, which focuses your readers to process the detailed findings that led to this conclusion. The overall approch, key results and conclusions. Details should be concise, limited to the most important aspects of experimental design, and incoporated into the description of the results (ie. "Using... we..."). Focus on the most important findings that underpin the main conclusions. Avoid using numbers. The advance over previous work and the implications. How does this conclusion change our understanding of the field? What are the immediate and realistic implications across broad disciplines? Help readers understand where your work leads. Is it too short or too long? Does the first sentence provide enough introduction to the topic? Is there a statement with the main findings starting with ‘Here we show…’ or a similar phrase? Does the author describe the main findings in a suitable level of detail? Does the author put the main findings into a general context, and do you understand what was achieved? Are any useful implications mentioned? What are the main keywords? The first prerequisite is good science - scientifically useful and technically sound. The second prerequisite is that a great paper must tell a story - communicated in a clear, concise and coherent way, so that readers will understand what you did, what you found, and how you reached your conclusions. Broad Impact: Are researchers in other fields likely to find the novel conclusions of scientific interest, or to be directly affected by them? Specifically, does your manuscript: 1) provide mechanistic insight, 2) inspire further research, or 3) provide important resource value, technical breakthrough, or quantifications. What is the broader context and impact of your work? Do your data compellingly support your conclusions? What’s been done before? Does your work change the current thinking in the field? Does your research deal with a big problem or issue in the field? Create clear and uncluttered figures that represent the data fairly. Figures serve to: 1) help readers understand and evaluate complex data and ideas quickly, and 2) show readers how you reached your main conclusions. Decide what your main message is. Determine the best graph type for your data. It may seem obvious but choosing the correct plot type will display the data correctly, allowing readers to see the most important message immediately. A brief and descriptive title that explains what the figure is (and applies to the whole figure, including the panels). This can be descriptive or declarative. Brief materials and methods description, but this in not always necessary. This would include the cell type, animal model, conditions, treatments tested, controls, number of replicates and repeats. This information should be limited to what is absolutely necessary to understand the figure without referring to the methods section. Definitions of scale, error, an explanation of all symbols, patterns, lines, colors, non-standard abbreviations, scale bars, and error bars (standard deviation or standard error), as well as any other potentially non-intuitive features, in the figure itself. These definitions can exclude aspects that are already described in the actual figure, such as in a key accompanying a graph or schematic. P-values and sample size should also be included. Include statistics wherever possible. Are the figures set at an appropriate size? Is the text an acceptable sans serif font? How does the overall figure quality look? Have you used red and green combinations? R values (capital, not italic, initial zeros okay) and r values (lower case, not italic, initial zeros okay)? Have you labelled all axes? Is the label orientation appropriate? Are the panel figures aligned? The Introduction section is important for providing context for the findings, and there are many different approaches for structuring this section. So which approach is the best? The most important aim of the introduction is to set up the objective. You may include general background information on the overall topic if you want your paper to be read by non-specialists, but this information should be brief and directly relevant to your main argument. You should also help the reader to understand why the objective is important, such as why it is useful or how it can be applied. Much of this section should focus on the findings of studies that looked at similar objectives. What do we already know in the system that you are studying and related systems? What do we not know that you aim to find out? Here is your chance to delineate the edges of the gap in knowledge that you outlined in the Abstract and show the reader why investigating your objectives is useful. For each method, the level of detail that you should provide will depend on to what extenct you followed established methods. If there were no changes (including reagents and equipment), you can list a very short summary and citation. Any differences from a previously described method should be detailed. If the method is entirely new, you should describe it in full. The results are the defining feature of a paper that describes original research, and the Results section is where you present the core of your work and describe the most important features and patterns of your data. The Results section should be presented as a clear and succinct narrative. [Link to previous paragraph]. To [aim], we [method]. We found [key features of results (Fig/Table Ref)]. [Key feature of results (Fig/Table Ref)]. [Key feature of results (Fig/Table Ref)]. This suggests [conclusion from these results]. Examine the findings from the viewpoint of a reviewer and anticipate their most important comments. Are there any aspects of your argument that you did not demonstrate experimentally? Can you explain why and how the previous findings suggest that readers can trust the findings without that demonstration? Provide context for these important findings within the current literature. You can resume the narrative from the Introduction section: you delineated the gap in knowledge in the Intro, so to what degree do your findings now move the field forward? Are any other studies relevant in light of there new results? Explain your argument. Were there any surprises or contradictions with previous work? If so, what does that tell us about this study or that previous work? Does it help resolve a controversy? Are there aspects still unresolved? Are there any features that couldn't be explained? If so, what might that be telling us? Ideally, the conclusion should offer something new to readers by outlining the implications of the findings on the field and related fields and making suggestions for future research. Do keep this short and focused on immediate implications. A good approach is to provide a deeper discussion of the results immediately after explaining the relevant findings. Then, an overall discussion can go after you have presented all of the results. Cover letters are your opportunity to address the editor directly and make a case for why your paper should be published. You are not bound by the conventions of scientific writing, so it is a fantastic idea to tell the editor why you find the study so exciting while sticking the the science and avoiding excessive hype. Remember that editors are not obligated to read the letter, so keep it concise at 1 page of text, excluding contact details and referee suggestions. The diagram indicates a structure that works well for most purposes. The diagram summarized the key statistics for the biological sciences team at Nature. 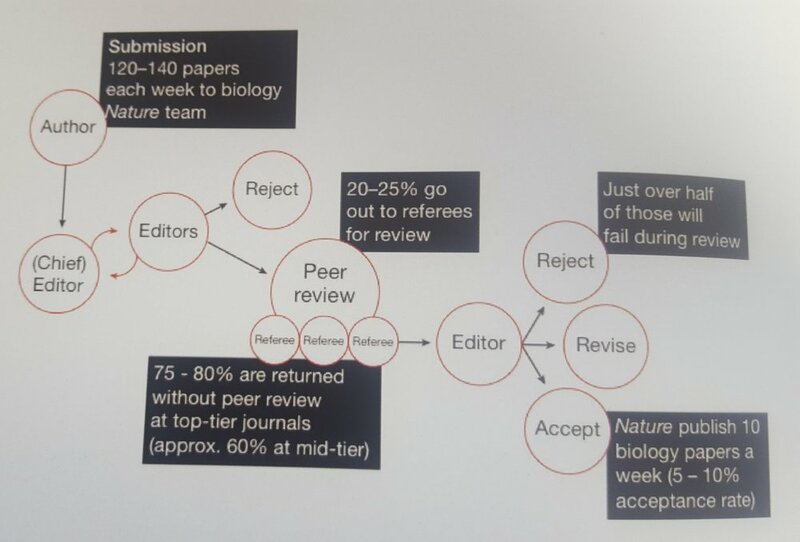 The editorial process can vary from journal to journal depending on many factors, including: 1) whether the editors are professional or academic, 2) the presence of an academic board and the strength of intial screening by editors based on the perceived level of interest of the readership in the findings. Peer review is an expert quality control mechanism to screen for technical correctness and scientific accuracy, and it should improve the quality of the paper. Referee comments form the basis of the decision on whether to accept a paper, but editors are ultimately responsible for the outcome. There are different types of peer review, most common of which is 'blind' peer review, where the referees know the identity of the author, but not vice versa. Do I understand it? Are the methods and key research objective clearly explained? Do the authors summarize and reference existing literature appropriately? Is it well presented? Do I believe it? Are the conclusions justified by the data and are the methods valid? Do I care? Is the main finding important and interesting? Is the work original? Remember to stick to what you know; you can have to cover all aspects of a paper. Make clear to the editor where your expertise ends so that they can consult additional reviewers. Always acknowledge help from others, and always return the review on time. Invite authors to revise their manuscript to address specific concerns before a final decision is reached. Only resubmit when all comments have been addressed comprehensively. Remain professional when responding, as reviewers are human and can make mistakes. If additional experiments are requested, do not argue unless you have a good reason. If you think rejectino is unfair, you can appeal. To do so, you should determine the reason for the initial rejection and address it, as well as all other criticisms in the appeal. This may involve presenting new data to strengthen your claims and expand the scope of the paper. You can also point out factual errors during the decision process and detail the specific contribution of the work to the field and its immediate impact. Argue your points scientifically. If accpeted, there will likely be an embargo on the paper to enable news to 'break' the story at the same time to gain media coverage. Any journalist that you talk to before publication must agree to honor the embargo. This does not restrict you from discussing your work with other scientists, giving conference presentations, and using prepring services, such as arXiv. This should be anticipated. You should respond to criticism professionally and in a comprehensive manner. The main findings of your paper may be slighly amended, but the paper will be retracted if the key finding is severely damaged. Is the manuscript logically organized? Is the manuscript clear and easy to follow, telling a story? Is the thesis of the manuscript clearly presented early on and are the Results and Discussion sections addressing the main points? Do they provide clear conclusions? Are the paragraphs logically structured and connected by smooth transitions? Do they start with generalities and move toward specifics? Do they only contain one idea or theme per paragraph? Are sentences appropriately structured and linked? Do they use the ‘active voice’? Is the manuscript concise and its overall length appropriate? Is there any redundant material that could be omitted? Is there any overlap between the different sections? Is the manuscript appropriately referenced where needed? Are the terminology, units and scales consistent throughout the manuscript? Does it accurately describe the main findings of the manuscript? Does it contain the essential keywords to allow for accurate indexing and database searching? Is it self-contained and can function as a stand-alone document? Does it succinctly state the principal objectives and scope of the investigation where these are not obvious from the title? Does it concisely summarize the results and principal conclusions? Does it convey the context in which the results are relevant? Does it set the context for your study? Does it provide a clear and coherent description of the background literature and the contribution of the referenced works to the field? Does it establish the significance of the current work in relation to previous research? Are the scope and objectives of the current manuscript clearly established? Does it briefly describe what you have done? Does it provide a brief statement of the principal findings and conclusions? Does it provide enough detail to be reproduced? Is it logically organized and presented? Is it appropriately referenced where needed? Is the use of the method justified? Are the statistical methods described in enough detail? Have P values been given for primary analyses? Has a sample size calculation (or justification) been given? Are the name of statistical tests that were applied clearly stated? Is there justification for the use of these particular tests? Are data exclusions stated and explained? Are the data clearly and concisely presented, with important trends extracted and described? Are the data logically presented (for example, in the order of decreasing importance)? Is the statistical analysis clearly described? Are numbers quoted with the minimum number of digits or decimal places in a consistent way? Are the figures clear, of good enough quality and complete (labels, legends, axes, etc.)? Are the figure captions clear and self-contained? Are the paragraphs presenting the main message in the first sentence - thus, using the ‘top-down’ approach? Does the discussion make clear points; does it draw firm conclusions? Are the conclusions well substantiated by and discussed in terms of the results presented in the manuscript? Is the significance of the conclusions and results discussed and related to the objectives of the study in a transparent way? Do the Discussion and Conclusions provide an understanding of how the results fit into a bigger picture, rather than repeating the same information presented in the Introduction and Results & Discussion sections? Do the paragraphs present the main message in the first sentence - thus, using the ‘top-down’ approach? Does the reference list provide a selective, yet representative basis for substantiating previous works and claims made in the manuscript? Is the reference list formatted according to the convention used by the journal to which you intend to submit the manuscript? Is the reference list balanced with respect to self-citation and citing the works of others? Has the appropriate journal been chosen based on the intended audience, scope and quality of your manuscript? Have you carefully read and adhered to the Instructions to Authors? Does the cover letter make a strong case for publication of the manuscript in the journal of choice? Does it contain all the information requested by the journal? Does it list suggested and excluded reviewers?